Description Of Item: Stage your own pro football showdowns! 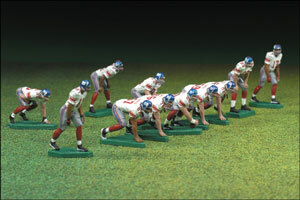 This NFL Ultimate Mini Team collection makes a great gift for yourself or that football fanatic in your life. It contains 11 of your favorite offensive players from the 2008 Super Bowl-winning team, the New York Giants! Buy now and let the ultimate games begin at your house!